Potato sales and volume fell slightly for the third year in a row. However, potatoes are still a more than $2.5 billion a year business at retail. Focus on growing your potato sales by marketing to younger consumers as younger consumers are less likely than older shoppers to purchase potatoes. Russets are the most popular with consumers, but red potato sales are growing, so market all varieties well. Potatoes have taken a bum rap for their starch content, but this popular vegetable has plenty to offer in the way of health content. Potatoes are a good source of potassium, which has been shown to help lower blood pressure. They are also high in vitamin C, which helps to fight cancer and can boost the immune system. Potatoes contain vitamin B6, which helps enzymatic reactions to take place in the body. As a group, potatoes group contain more than 60 phytochemicals and vitamins. 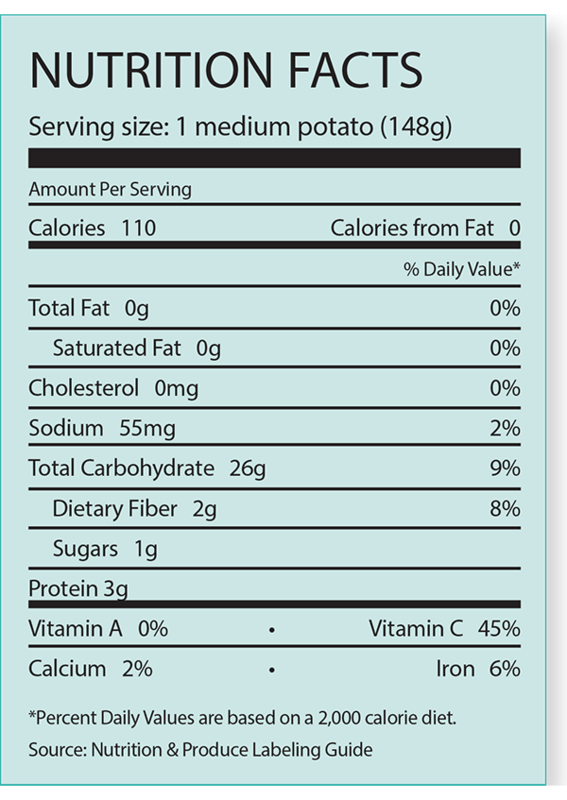 The U.S. Food and Drug Administration has approved the following nutrient content descriptors for potatoes: fat-free, saturated fat-free, sodium-free (must state that potatoes contain less than 5 mg sodium per 85 g potato), cholesterol-free, high in vitamin C and a good source of potassium (add 720 mg potassium; 21 percent daily value to label). Potato sales increased again in 2017, rising 2.6%. However, volume dipped slightly while per-pound retail prices increased nearly 3%. Potatoes have a host of cross-merchandising options, including potato toppings such as butter, sour cream, cheese and bacon, broccoli, green onions and meat and poultry. Potatoes are available in plentiful supply year-round. Promote them for a variety of uses throughout the year. Fall: Promote potatoes as a great addition to soups and stews as days get colder and longer. Winter: Include potatoes in holiday promotions as mashed potatoes are a holiday staple in many homes. Promote stuffed potatoes as a hearty meal for a winter’s night. Spring: Red potatoes are an excellent addition to Easter meals, adding a splash of color to the plate. Summer: Include potatoes in summertime grilling promotions as they are a natural pairing with grilled meat. Promote the health benefits of potatoes to overcome the negative perception that starchy vegetables aren’t good for you. Offer plenty of variety in your potato display. Russets, red potatoes and yellow yukon varieties should make up the bulk of your display. Add fingerling and purple potatoes to the display to add color and interest. Constant exposure to light causes potatoes to turn green. Place potatoes near onions as they are a natural pairing. Put your potato display in a high-traffic area. Add a secondary display in the meat department during the summertime barbecue season. Offer both bagged and bulk product to appeal to a variety of shoppers. Potatoes’ nutrients are close to the skin, so use a vegetable parer to just remove the skin and not the layer of potato underneath the skin. Use russet burbanks for french fries. For a homestyle look and flavor, leave the skins on. Consider making your own chips as a side for sandwiches and burgers. Offer a baked potato bar along with a salad bar. Include fresh toppings like green onions and broccoli. Move potatoes to the center of the plate by offering stuffed potatoes. Potatoes can make a multitude of side dishes from baked potatoes to potatoes au gratin. Offer hash browns made with fresh potatoes as part of your breakfast menu. Use red potatoes for mashed potatoes. Leave the skins on for a splash of color in your dish. 100-lb. sacks 50-lb. cartons/sacks 50-lb. baled, 5 10-lb. or 10 5-lb. Common retail sizes are 60-, 70-, 80-, 90- and 100-count cartons Consumer packs For convenience, shippers offer 5-, 8-, 10-, 15- and 20-pound mesh or polypropylene plastic or paper con-sumer bags in master containers or loose bulk bins. RPC – 6419, 6420, 6423, 6425, 6426 Foodservice packs Suppliers now offer a variety of sizes. Temperature: 45 to 50 F (7 to 10 C) Relative humidity: 90% Mist: no Typical shelf life: 30 days Odor sensitive/odor producer (Do not store or transport odor-sensitive items with commodities that produce odors. Potatoes produce odors that will be absorbed by apples and pears. Potatoes will absorb odors pro-duced by pears.) Highly sensitive to freezing injury. (Likely to suffer injury by one light freezing.) Susceptible to chilling injury (Damage sometimes is not apparent until produce is returned to a warmer temperature.) Avoid prolonged exposure to light because even a small amount of exposure can cause potatoes to green. Early- and summer-harvested potatoes usually are not held in long-term storage. However, about 75% of the fall potato crop is usually stored in farm or commercial warehouses. Tablestock in storage requires a temperature of 45 F (7 C), when a sprout inhibitor is used. Temperatures maintained for an extended period of time below 40 F (4.4 C), can cause product to adopt a sweet flavor. Higher temperatures encourage sprouting and shriveling. Sprouted potatoes can still be used once the sprout is broken off and the potato is peeled. Selecting potatoes without irregular shapes will result in less waste when peeling. 76% of consumers said they purchased potatoes in the past year, making them the most-purchased produce item in the Fresh Trends survey. Consumer prefer to purchase russet potatoes, with 35% of those who bought potatoes saying they bought russets. Consumers most often use potatoes as a side dish or as an ingredient in a recipe.